Radicals order officer not to interfere with assault. NEW DEHLI (Morning Star News) – Police in Bihar state this month obeyed Hindu extremist orders not to interfere as they beat a pastor and a Bible college student, sources said. 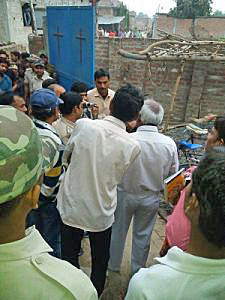 The Hindu extremists in the eastern state of India lured Assemblies of God pastor Ajay Kumar and a trainee to a marketplace in Begusarai on March 17 by saying they wanted to learn more about Jesus, the pastor said. As Pastor Kumar and the trainee, identified only as Assaryav, reached the Har-Har Mahadev cross-road, the Hindu extremists who had called them arrived on motorbikes, he said. The two Christians were surprised to learn that the Hindu radicals did not want to learn about Jesus but rather asked the pastor to perform a wedding ceremony of a Hindu man to a Christian woman, Pastor Kumar said. He repeatedly told them he could not marry them in his church. When they offered him money to officiate the wedding, the Christians suspected the hard-line Hindus were trying to entrap them with the appearance of Christians taking money to fraudulently convert people, he said. The pastor learned that the hard-line Hindus were members of the Bajrang Dal, youth wing of the Hindu extremist Vishva Hindu Parishad (VHP), which in turn is part of the radical Rashtriya Swayamsevak Sangh (RSS). When the pastor and trainee refused to take the money, the extremists kicked and struck them with their fists on nearly all parts of their bodies. An area policeman ran toward the site of the assault and complied when the extremists told him to “remain out of this and to let them handle the Christians in their own way,” Pastor Kumar told Global Christian News. The pastor was kicked in his face, ear and stomach. He sustained internal injuries and still has pain in his ear. Assaryav’s thigh was injured. The policeman left and informed senior officials. The officers arrived and arrested the two Christians rather than the assailants, Pastor Kumar said. Police detained them until after midnight before releasing them on bail. The Christians were charged with “deliberate and malicious intention of outraging the religious feelings of any class of citizens of India,” sections 295/295-A of the Indian Penal Code. Pastor Kumar said that his wife and 3-year-old daughter were deeply disturbed by the assault. Two days later (March 19), Hindu extremists gathered outside the Mahanaim Church building as they finished worship in a village just four kilometers (less than three miles) from the marketplace where the two Christians were assaulted. Shouting “Stop forceful conversion,” the Hindu extremists verbally harassed 61-year-old pastor Christopher Bhonsle. Members of the 150-member congregation locked the church doors and called police, the pastor said. About 20 church members remained inside the church building at the time. Demanding they open the door, the Bajrang Dal members accused the Christians of “conversion activity,” Pastor Bhonsle said. Police arrived, heard only the Hindu extremists’ accusations, and took the names, addresses and phone numbers of the Christians, he said. The pastor said officers “did whatever the Hindu extremists asked them to do,” and entered his house without a warrant, overturning everything inside. The Hindu extremists had been overheard saying, “We will not allow this foreign religion in our country, and if you continue doing this, we will kill you,” and police were searching for foreign currency, Pastor Bhonsle said. “The search went on for an hour, and when the police could not find anything, they started to scold me for conducting church,” he told Global Christian News. Police later returned to the pastor’s home and told him that they had pretended to scold him to appease the Hindu extremists, he said. Pastor Bhonsle said fear has gripped Christians throughout Begusarai District, as police have clearly sided with the Hindu extremists. Pastor Bhonsle, Pastor Kumar, Assaryav and pastor D. Joshua went to Patna, capital of Bihar, to meet with the chief minister of the state about anti-Christian hostilities on March 20, but the appointment was abruptly cancelled, they said. The leaders of three churches in Begusarai on March 23 applied with authorities for police protection, and the superintendent of police ordered a police Jeep to be stationed every Wednesday, Friday and Sunday morning in front of the Mahanaim Church building. Police were ordered stationed in front of Pastor Kumar’s church gathering, where 25 people worship in a rented facility, every Sunday morning. Two other attacks in Bihar were recorded in January and February, according to the Evangelical Fellowship of India (EFI). A pastor from the India Pentecostal Church, associated with India Missions of Kerala, was attacked on Jan. 7 when about 10 people in Buxar attacked him with bricks, injuring his forehead. The pastor declined to register a complaint with police. 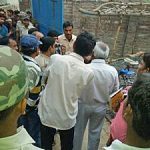 In Hzipur, 10 Hindu extremists on Feb. 10 attacked Pastor Sikander Kumar and other members of Mission India Church after a wedding. Six Christians including a woman were injured in this attack, according to EFI. Bihar is the third-largest state of India by population. Nitish Kumar of the Janata Dal (United) party has been chief minister of Bihar since February 2015.